1995 - 2003 comp. 6 pcs of various black-prints, i.a. Zsf.PT69, 72, 91, 140, 148, Benedict 2003. 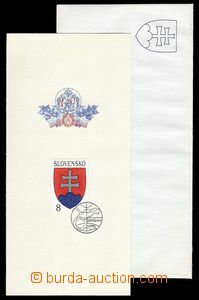 1993 special ministerial first day sheet with stamp. Big state coat of arms, Zsf.ZNL1, incl. envelope/-s. Printing 200 pcs. 1998 letter franked with. falešnou stamp. 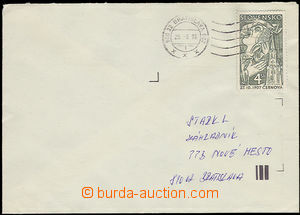 to defraud the post, Zsf.135, MC Bratislava 022 / 25.8.98. 1994 Art J.Alexy, Zsf.PL50 VCH, imperforated counter sheet. Unikát, single known piece! 1997 4 pcs PLATE PROOF stamp. 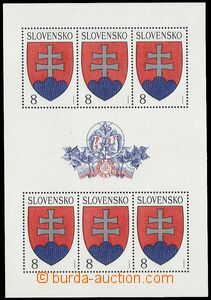 Zsf.118, stages of print single colors with signature of author. 1997 PLATE PROOF in black color stamp. Zsf.126 with signature of author (1x vygumovaný signature). 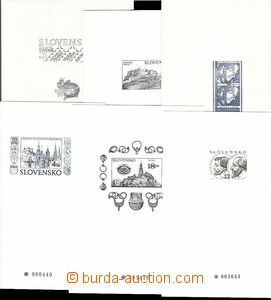 1998 miniature sheet Nitra with omitted print emblem / symbol exhibition, Zsf.148H VCHa. Unikát, single known piece!! 1998 black print stamp. Nitra from miniature sheet, PT148, without numbers and relief exhibition. 2001 3 pcs PLATE PROOF in black color stamp. Fauna values 14, 15 and 16 SKK, all with signature of author. 2003 6 pcs PLATE PROOF stamp. Art Zvěstování, stages of print single colors with signature of author. 2003 PLATE PROOF gravure from FDC with signature of author. 2003 PLATE PROOF stamp. 100SKK Pezinok in black color with signature of author. 2003 PLATE PROOF stamp. St. Benedict and Svorad in black color with signature of author. 2003 4 pcs PLATE PROOF stamp. from miniature sheet Saints Cyril and Methodius, Zsf.H289, in/at blue and black color. 2003 miniature sheet Saints Cyril and Methodius, Zsf.H289-90, print of whole miniature sheet in blue color with signature of author. 2000 CSO 6, official envelope with New Year's card, superb. 2001 CSO 7, official envelope with New Year's card, superb. 2001 CSO1, official envelope with New Year's card, Us. 2002 COS 8, official envelope with New Year's card, superb. 2003 CSO 9, official envelope with New Year's card, superb.